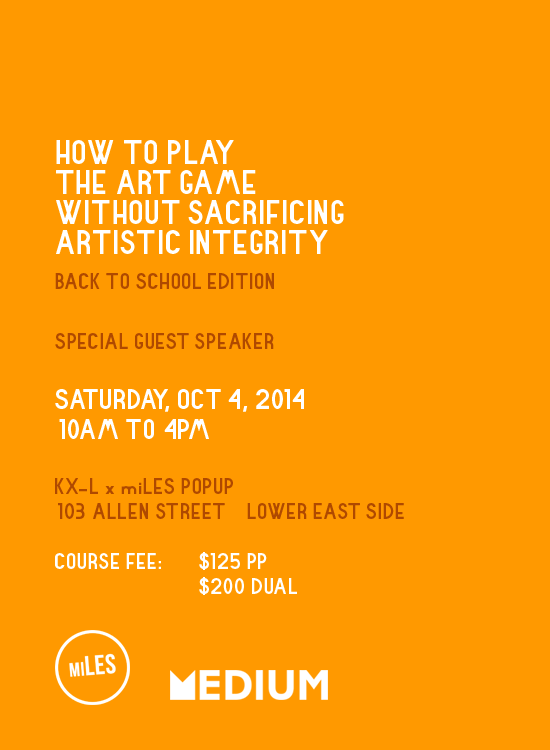 On Saturday, October 4, 2014, art professionals, mani Olu and Larry Ossei-Mensah, will host the back to school edition of The Rules: How to Play the Art Game without Sacrificing Artistic Integrity at KX–L x miLES, located at 103 Allen Street (corner of Delancey and Broome) from 10a.m. to 4p.m. Have trouble finding time to invest in their practice due to work, family, lack of motivation, etc. Each participant will leave with a SAFE (Systematic Approaches for Everyone) Plan Workbook, an 18-page document that helps artists organize and chart their goals in 3, 6, 9 and 12-month increments. Saturday, October 4th, 2014, 10a.m. – 4p.m. Space is very limited. Register today.